BOSTON — The cheers grew louder at TD Garden on Monday night, from an appreciative cheer to an all-out roar. 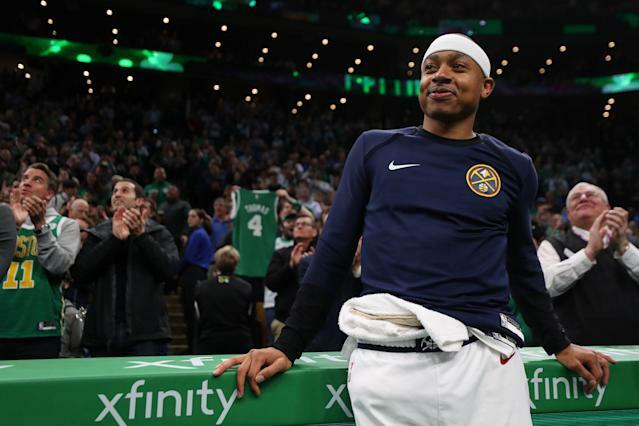 From the second Isaiah Thomas’ jersey number appeared on the Jumbotron to start his tribute video, Celtics fans forgot about yet another slow start and bathed in the memories Thomas produced in his short but memorable stay in Boston. And Thomas embraced the moment, coming down from the tunnel to the bench to enjoy an ovation he felt he deserved but one he never thought he’d receive. “I was emotional, I almost cried,” Thomas confessed. Thomas is now employed by the Denver Nuggets, the team that clinched its first playoff spot in six years with a 114-105 victory over the Celtics. But Thomas still yearns for Boston. From the special Celtics green-and-gold Nikes he wore Monday night, which he had made in the event Boston made the 2017 NBA Finals, to the old “King of the Court” T-shirts and Thomas jerseys many fans wore for his return, the love was certainly mutual. It harkened back to the days when the Celtics didn’t have to play up to expectations, days in which the shortest man on the floor lifted the franchise to places few deemed possible at the height of his powers. He had Celtics attire delivered to him from team personnel after the game and tucked a pair of green-and-gold Celtics game shorts inside his sweats before heading outside the locker room to meet with the media. As much as Thomas was a victim of circumstance in Boston, when Danny Ainge flipped him for Kyrie Irving in the summer of 2017, he’s in similar shoes this time around. He believes he’s fully healthy, but the deep Nuggets are stocked in the backcourt with Gary Harris, Jamal Murray, Monte Morris and Malik Beasley, resulting in Nuggets coach Mike Malone removing Thomas from the rotation over 10 days ago with the team locked in a battle for the Western Conference top seed with Golden State. If this were the start of the season with Thomas back from the nearly year-long recovery from hip surgery, perhaps the Nuggets would be more amenable to letting the once-explosive guard find his rhythm (8.6 points and 15.6 minutes per in nine games). But the stakes are too high to experiment, and Thomas finds himself being a cheerleader instead of catalyst. His six-minute stint Monday night — a stretch starting late in the first quarter — saw the Garden crowd cheer his every dribble and groan at his two misses, a long jumper that came up short and an airballed floater that felt like an adrenaline miss. Thomas is still a confident player, although the things that have happened since being traded to Cleveland had to have tugged at his confidence. Because of his height, there’s a fine line that separates a star player from an insignificant one, and his hip injury appears to have sapped the shifty quickness that made him special. Brandon Jennings was an explosive and similarly built guard, yet once he tore his Achilles in 2015 it’s been a struggle to find consistent footing in the NBA. Could the same fate be in store for Thomas? Instead of setting off the Garden with fourth-quarter scoring bursts, he was a playful heckler to former comrades in green. When former teammate Al Horford hit a corner three to bring the Celtics to within three midway through the fourth quarter, he and Thomas exchanged wry smiles. Jaylen Brown also playfully chided Thomas over Brown’s perceived ability to guard him. “I told him I need, like, six hands around me, I need three people to guard me,” Thomas said with a smile. If it feels like Thomas is desperately trying to reclaim old glory as opposed to fighting for bitter vengeance against the franchise that traded him after he played through injury and his sister’s death on the eve of the 2017 playoffs, it’s because this is the one place that fully embraced him as he sees it. Thomas is on his sixth team in eight years, and the Celtics worked around his limitations to not only keep him from being a total liability on defense but also presented him with a chance to be a two-time All-Star and MVP candidate. He helped reward them with the East’s best record in 2017 and a conference finals berth. That freedom and seemingly the personal connections borne of unfortunate circumstances bonded him with this city in ways he couldn’t imagine. Before Thomas concluded his media session and went to Celtics coach Brad Stevens’ office for a 20-minute chat, he was asked what Boston meant to him.